Harjeet hard to beat…yes it rhymes! NO MATTER which angle you look at it, it is hard to see Harjeet being beaten at Devonport on Friday night. Winner of his last six outings, the rising star will tackle a Raider Stake heat for trainer Todd Rattray. A last-start winner of the Group Two Easter Cup, the son of Rocknroll Hanover is a prohibitive $1.04 favourite against five rivals. Harjeet will begin from barrier five, with Rattray confident his stable star can extend his winning streak. “I couldn’t be happier with the way he is going,” Rattray said. “He came through the Easter Cup well, had a few days off and is ready to go again. Should all go according to plan, Harjeet will contest the $40,000 Raider Final, which is scheduled to be conducted at Devonport on May 4. Following the Tasbred series Harjeet may be taken across Bass Strait to tackle the Empire Stallions Vicbred Super Series in June. 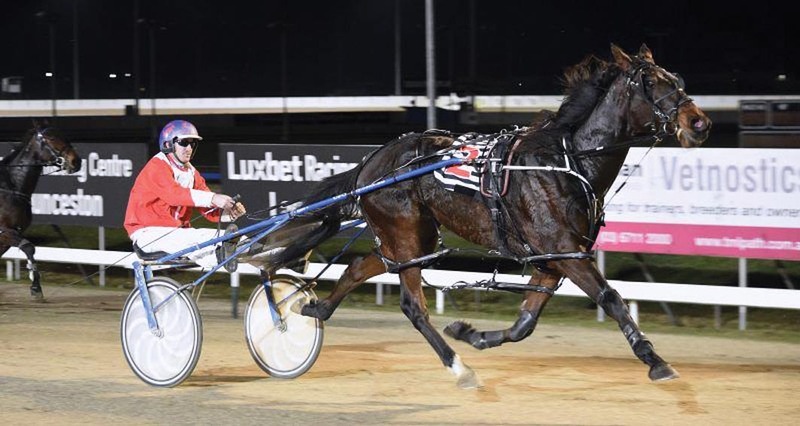 “I’m just focusing on the Raider Stake for now, but he is also eligible for the Vicbred,” Rattray said. “If he comes through this series well enough I will give the trip some thought. Rattray also has Zhukov Leis in the second heat, with the son of Somebeachsomewhere drawn to lead throughout from the pole.